Take a little more transit and eat a little less meat — two things you can do to reduce your impact on the environment. 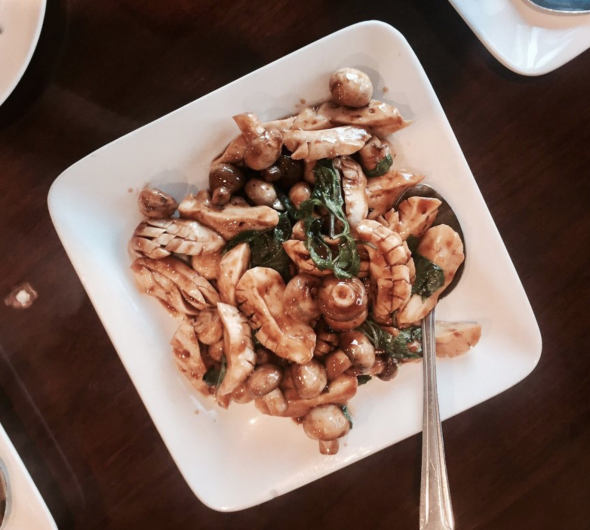 In this installment of Meatless Mondays with Metro, we head to the San Gabriel Valley for some vegetarian Chinese food. Vege Paradise is a family-style spot that offers budget-friendly vegetarian Chinese food. Their dishes are flavorful, savory and perfect for when you’re craving something traditional, like kidney and basil, but want to go meat-free. Other dishes worth a try include the steamed bitter melon and the crispy vege chicken nuggets. And don’t forget to order a puff pastry pumpkin soup for dessert! Vege kidney and basil. Photo by Ryan L. via Yelp. To get to Vege Paradise, take Metro Bus 487/489 to Del Mar/Valley. You can also take Metro Bus 76 to Valley/Abbot. If you have other recommendations for vegan/veggie restaurants, let me know in the comments! #LotusVegan in North Hollywood is a short Red Line trip to NoHo and a quick jump on a bus heading south. Please remember to post the address in the main text. If someone is riding a bicycle to the location, they need to know where. And OH BTW it is -upstairs-. Did not see an elevator or escalator.